Total knee arthroplasty, also known as total knee replacement surgery, is a procedure performed by an orthopedic surgeon, during which the ends of the bones in a knee joint are replaced to create new joint surfaces. New joint surfaces are sometimes needed when patients suffer long-term joint damage due to osteoarthritis of the knee or post traumatic arthritis of the knee. Unlike partial knee replacement surgery, which only removes a certain portion of the joint, total knee replacement is done when there is severe damage to the joint. It is typically recommended when knee pain is affecting your ability to participate in daily activities like walking and climbing stairs. Why is total knee replacement surgery performed? Osteoarthritis of the knee is a type of knee arthritis characterized by painful inflammation of the knee joint caused by cartilage deterioration. The condition can cause severe pain and loss of knee functionality over time. Post traumatic arthritis of the knee is caused due to damage to the cartilage in the knee that develops following an injury, such as a fracture. Rheumatoid arthritis of the knee is a chronic inflammatory disorder characterized by the deterioration of cartilage in the knee due to the immune system attacking the tissues. This type of arthritis can affect other joints in the body as well. What does total knee replacement involve? 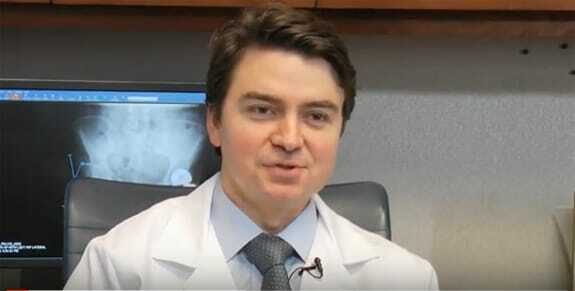 By employing his Rapid Recovery approach — including various interventions taken before, during, and after surgery — Dr. Sculco is able to help his patients return to their everyday lives faster following total knee replacement surgery. Typically, patients can expect to experience some swelling and pain after undergoing knee replacement surgery. Dr. Sculco is dedicated to improving your recovery by limiting post-surgical pain and other side effects. Over the years, he has been involved with extensive research on topics including less invasive surgical techniques, anesthesia use, anti-inflammatory medications, and specific instruments used during the procedure. This research has led Dr. Sculco to a fine-tuned recovery approach that has been proven to decrease inflammation and pain following surgery, as well as accelerate the body’s healing process so patients can get back to doing what they love faster. Learn more about Dr. Sculco’s recovery approach by visiting our Rapid Recovery page.